Well it was just another snow day here. I am sure a lot of you are familiar with those this winter. 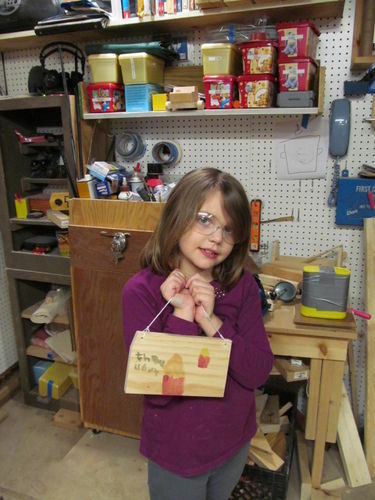 While I was working on a few things in the shop my daughter decided she wanted to do something as well. She is a big fan of the Doc McStuffins cartoons and decided she needs to have a clinic as well. For those of you not familiar it is on Disney Jr. and the character takes care of toys in her clinic in the backyard. Since my daughter’s yard is more in the basement she decided to turn her playhouse into the clinic and she needed a sign to let toys know if she is working. She is still working on actually writing in paint. But she did everything herself except for putting the string on as she could not get it through the holes she had drilled. She uses an eggbeater style drill with about 5 different bits. 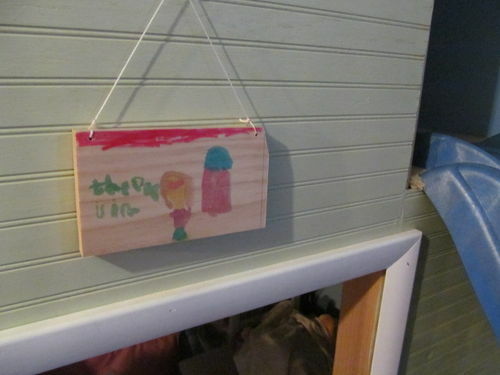 The sign of course is two sided to either read “The Doc is in” or The Doc is out” She also decided she needed to glue some other pieces up in order to make a stage for her dollhouse family to have a show. 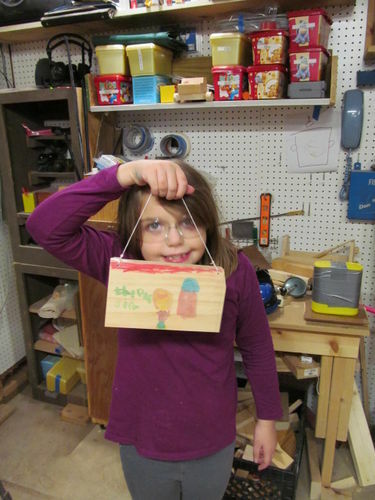 I love that she just grabs scraps and comes up with ideas for them and I am trying to encourage more and more to come up with her own ideas and work on them, the sign was on of these. I will have our monthly project coming in a few weeks. I consider you one of the luckiest LJs here. I will always wish I could spend time together with kids. Keep marching on. This is one of the most satisfying aspects of what we do. My children are all grown, but I’ve just begun to do some projects for my grandkids and nothing is more fun. Oh yeah…my daughter is planning a Doc McStuffins birthday party for my granddaughter next month! This would make a great party gift for her! My 4 year old daughter is also a Doc McStuffins fan, her new thing is playing doctor or nurse, and insisting that I help her build a hospital with her blocks. I’ll take that show over Dora any day. I can see my little girl doing stuff like this in the near future. Good for you—gotta get ‘em started early! She needs to have a clinic. Thats too much. Maybe I should make a shop sign too.The Butcher’s in The Butcher’s out. Great that you get to share the moments. HotnCold- look forward to seeing a few of those projects. Brian- Hope she gets in the shop with you every so often. I made my daughter a set of blocks out of cut offs. She still uses them on occasion.